The 38th BDO World Championships come to a climax on Sunday when Martin Adams faces Scott Mitchell in an all-English final at the Lakeside Country Club. Lincolnshire-based Adams, 58, is a three-time world champion and is one of the best-known names in darts, but what about his opponent? Here is a quick guide to the 44-year-old landscape gardener from the New Forest, who is hoping to tame 'Wolfie' and win the world title for the first time. Mitchell was born in Bournemouth and now lives in nearby Bransgore with wife Sharon and his two children, Katie and Sam. His walk-on music is "Who Let The Dogs Out?" by the Baha Men and the colour pink dominates his darting attire, appearing on his shirt and his arrows. "The World Championship has been part of my life since I was an eight-year-old," Mitchell told BBC Sport. "We didn't have Christmas at Christmas - we had it in the first weekend in January. "That tied in with the FA Cup third round, so I have a really strong bond with that. We were all sat round watching the darts and listening to the football results. "Now to be part of the history of this place is very special." After more than two decades playing in local pub leagues and then at county level, Mitchell qualified for his first World Championship in 2010. Following three consecutive first-round exits, he finally won a match on the Lakeside stage in 2013 but had never been beyond the last 16 until this year. "I was the new guy and just happy to be here. That isn't good enough - you've got to come here and play," Mitchell said. Many onlookers considered Mitchell was too nice to reach the very top of his sport. You will struggle to find anyone with a bad word to say about him on the circuit. But things changed in 2014, his breakthrough year. He remains a nice guy, but a serene rhythm and a steely determination are now evident every time he throws. The result? Plenty of ranking titles and a number four seeding at Frimley Green. "My head's a bit different," said Mitchell. "I feel part of the furniture now. "It's been six years and a long apprenticeship, but I'm showing that I've learned a bit." Mitchell has not faced a seeded player this week, but his journey to a maiden World Championship final has not been easy. He needed to break the throw in a sudden-death leg to defeat three-time runner-up Tony O'Shea in the first round, before wins over Belgium's Geert de Vos, Englishman Brian Dawson and Canada's Jeff Smith confirmed his spot in Sunday's showpiece. "When the top seeds go out, the pressure goes on to the next seed," he said. "When [number one seed] James Wilson went out, I was fully aware that I was then the top seed in our half. "I watched Jeff qualify in October and I told him then that somebody was really going to have to well to beat him. I never thought it would be me," he said after a comprehensive 6-0 win over Smith. 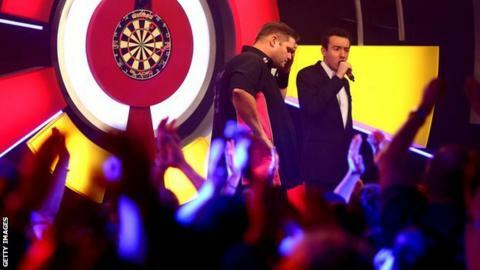 Mitchell has earned at least £35,000 for his week's work at Lakeside and will take home £100,000 if he wins the final. Some of his prize money is likely to go towards a new tractor for the family farm. From a darting perspective, lifting the world title would fulfil a lifetime's ambition. "I'm just a county player from Dorset who has played for England a couple of times and been here at Lakeside a few times," he said. "This is what the BDO can do for you. You can come straight off the street and be here."